Oats are traditionally grown in moist, temperate regions. However, improved varieties and management practices have enabled oats to be grown over a wider range of soil and climatic conditions. They have a high feed value and produce a greater bulk of growth than other winter cereals; they need less cultivation and respond well to superphosphate and nitrogen. Oats have two main uses: as a grain crop, and as a fodder crop (following sowing, fallow or rough sowing into stubble or clover pastures). Fodder crops can either be grazed and then harvested for grain after removal of livestock, or else mown and baled or cut for chaff. THE PRODUCTION OF OATS FOR GRAIN IN AUSTRALIA IN 1996-97. Production of oats fell by 38% to 1.1 million tonnes in 1999-2000, with falls recorded in all States. The largest falls in production were recorded in New South Wales (down by 58% to 284,000 tonnes) and Victoria (down by 35% to 296,000 tonnes), leaving Western Australia as the main producing State with a harvest of 439,000 tonnes. The majority of Australian oats harvested for grain is used domestically for stock feed purposes. A small proportion of high quality grain is used for human consumption. A small proportion of grain production is exported for human consumption. After three years of low plantings, the total area of oats planted in 2002-03 increased by 16% to 911,000 ha (table 14.16) as growers anticipated increased demand and prices for oat grain, especially for stockfeed. Due to the dry conditions production fell by 33% to 957,000 tonnes, the lowest level recorded since 1995. Production in Western Australia was less affected than other states, with a 14% drop in production. 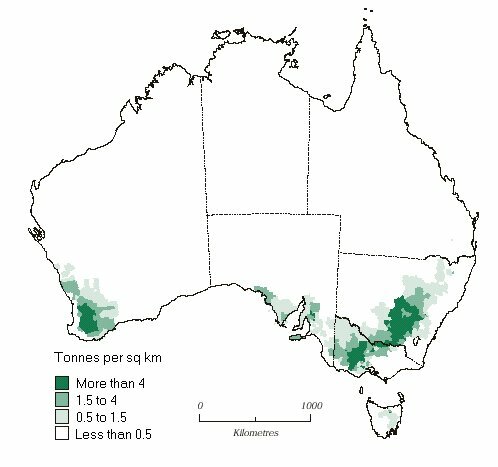 The Western Australian crop of 477,000 tonnes represented just under 50% of the national harvest.